Preparing students to become the STEAM literate citizens of tomorrow is a community effort that starts with parents and family members, and extends to include contributions from educators in K-12 schools, community colleges and universities; religious and other community leaders; and members from the local business industry. Engaging the entire community to support this effort is crucial. The University of San Diego hosts an annual one-day STEAM Youth and Community Conference to mobilize the community to help provide new pathways for youth to ignite, develop and pursue their STEAM interests, while simultaneously elevating the STEAM literacy, awareness and nurturing potential of the community. Attendance is free and open to all members of the community (i.e. students, family members, educators, community leaders, etc.) Join us for a day of engaging and inspiring presentations and interactive STEAM workshops from STEAM professionals, leaders, students and educators. Presentations will be given in English and in Spanish. We will have raffles and giveaways and lunch will be provided. The Fleet Science Center in collaboration with over 56 local STEM organizations has run over a year of free weekly programming outside the museum's walls. Daniel will share his experience collaborating with other institutions and how they present high-level content in an accessible format. He will also discuss strategies for engaging diverse audiences, mainly Latino/Hispanic communities. Binary Numbers: What They Are. How They Work. Binary numbers are very important in the design of computers. In this workshop you will explore with tennis balls, wooden sticks and mechanical and electronic binary counters to learn how binary numbers work. Your STE+aM Powered Brain explores the use of holistic cognitive and socioemotional approaches that facilitate 'flow' for diverse learners across grade levels, drawing from research and best practices in the neuroscience of teaching and learning. Contextually grounded in STEAM, this session provides strategies, tools and examples that promote engagement, creativity and commitment in the classroom as well as in the home. Resources focusing on the development and support of metacognitive skills (sound habits of mind) will be disseminated to attendees. Engineering students will present the project plan and engineering approach the team performed to develop a Solar Power Subsystem designed to power a Debris Collection Subsystem prototype for a Marine Robot designed to collect floating ocean plastic pollution. Students will create their own 2D video games using a proprietary video game design library ThoughtSTEM has created to teach students coding. In this session you will hear from renowned artist Salvador Barajas and his daughter about the basics of mural making and you will have a chance to explore colors and try out your own creations. Parents and their children will share strategies the parents used to encourage, inspire and enable their children to, develop a strong work ethic, pursue their dream and succeed. Artist Salvador Barajas will share information about his art and journey and will answer questions from interested and evolving artists. Come hear college students and alumni share their experiences, challenges and wisdom about making the most out of the college experience. Each panelist will share their story about pursuing STEAM majors. Participants will have the opportunity to ask questions and to gain valuable insights. Make your own chain reaction machines, designs with paper folding and circuits, and play mathematical visualization games. Learn the principles of photography and storytelling before adventuring out for a photography scavenger hunt! We will explore the famous photographers who have contributed to Nat Geo and Life Magazines to learn how to captivate audiences with photojournalism. Historic artifacts from the Veterans Museum will be the subjects of our classroom learning. For the final 20 minutes of the session we will roam the event photographing specific scavenger hunt items. Combining technology and art, you will be given specific narratives to show in your photo. The favorited photo of each session will receive a family membership to the Veteran Museum. What does it mean to be "under pressure"? What does it feel like? Why is it important for marine biologists to think about it? You and your team will conduct an investigation in the classroom to answer these questions! Participants will learn to create lyrics that enrich and reinforce science learning K-5 using big ideas, evidence, and familiar melodies. In this session we will introduce the newly established Engineering Exchange for Social Justice (ExSJ) at the University of San Diego and invite participants to collaboratively engage in an activity that explores the challenges that arise, particularly at the community level, when Social Justice is not a considered design requirement in engineering work. The ExSJ is a collaborative initiative lead by the Shiley Marcos School of Engineering and the Karen and Tom Mulvaney Center for Community, Awareness and Social Action. Through the ExSJ, community-defined 'problem briefs' will be turned into actionable student assignments, design projects, research theses or extra-curricular pro bono engineering projects (supported by local professionals) that will serve the local community as well as provide invaluable experience for students. SciChats@Salk is a video-chat-based science outreach program that pairs a group of students with a volunteer scientist for informal chats about what it's like to be a scientist and their research. SciChats will give the audience a clearer picture of how science progresses, encourage them to imagine a future for themselves as scientists, and illustrate the contributions that science makes to society. Rather than teaching content, SciChats embraces students' curiosity by letting their questions dictate the discussion, and emphasizes both the process of science and the people behind the science. Teachers that attend will learn how to bring this program to their classrooms and families will have the opportunity to ask the scientists questions directly! Did you know that bugs get sick too? Participants will learn about a common local butterfly species, the passionflower plant it eats, and a deadly 'zombie' disease that infects its caterpillars. You will then use microscopes to look for virus in insect samples. Don't worry, this disease is only deadly for caterpillars, and is perfectly safe for humans! Participants will also find out about opportunities to act as citizen scientists and make observations of these butterflies in their homes or classrooms. You might even go home with a beautiful (and tasty!) passionflower plant to attract these butterflies in your own yard. College Experience: Is There a Formula to Succeed in College? Join us to get the support, ideas and wisdom that comes from personal experience and decades of supporting college students. We will share our formula for getting the most out of your college experience. Audience participation and questions are encouraged! Finding the perfect job opportunity is not just about a strong resume, great cover letter and superb interview skills. Studies show that 92% of employers are using social media to hire future talent for their organization. Discover ways you can tap into the power of social media (and avoid the pitfalls) to find the right professional fit for you! In this interactive session, participants will be guided through the numerous free resources offered by the National Girls Collaborative Project, from a role model and mentoring database to an online tool for finding STEM opportunities and collaborators near you. Participants will have an opportunity to meet one another and ask questions around engaging girls and other under-represented youth in STEM learning. Drones are everywhere now, and they can absolutely be flown in the classroom! Learn how to program and fly CoDrone, the world's first programmable drone for education. We'll go over block-based programming, flight basics and ways that you can implement CoDrone for your learning environment. If possible, please bring your own laptop so you can download and work with Snap!, the language used to program CoDrone. See Instructions. Want to make the world a better place? So do we! Find out how engineers have the opportunity and responsibility to use their careers to improve the lives of others. This is your chance! Prepare a question to ask these experienced engineers and learn about their real-world problem-solving. In this interactive and highly informative session you will learn the steps required for preparing and applying for college. The session will cover how to decide on a college that suits you, how to prepare a personal statement, as well as other, often overlooked details of the college application process. Participants will work in groups as they experience what it is like to be an engineer. They will plan, build, test solutions to a unique challenge as they explore the engineering process. Use statistics and probability to estimate and make inferences about populations. MathArt: Creating Beautiful Art from Math Transformations. Paul will unveil and demonstrate the MathArt platform, an Angular 5 web app, developed for the USD STEAM Academy 2018 during the workshop. He will challenge those attending to make beautiful patterns and maybe learn some math. MathArt works on both a laptop and IPad using the Google Chrome Browser. Participants will be introduced to the water-energy nexus. Using recycled materials they will construct a water infrastructure and transport a given amount of water from "northern California" to "San Diego" using only a handful of supplies. Participants will be introduced to The Energy Coalition and all the programs offered to educators in the San Diego area, They will be shown the online learning platform and how to apply for services. This will be a interactive, hands-on lab. In groups of 4, participants will use various materials to design a cart that rolls freely. They will test their cart's design and collect data by rolling their cart down selected ramp heights. They will analyze their data and make a "Best Design" claim using their evidence. Make Your Own Chain Reaction Machines, Designs with Paper Folding, and Circuits and Play Mathematical Visualization Games. A college education is affordable and within your reach! Come to this session and learn how to make your dream of college a reality. Participants in this workshop will learn the principles behind some chemical reactions that cause a color change. Students will work in groups to carry out their own fun chemical reactions, and then be amazed as color changes before their eyes. In this presentation, Prof. Vazquez will talk about how Mayan knowledge of science drove his confidence and motivation to pursue a career in science and technology. He will also talk about his own career, and the importance of failure and persistence to succeed in academics and STEM careers. Coding, Robotics and Equal Access…OH MY! This workshop is intended to be an interactive presentation and conversation about the increasing role of STEM in society and our personal lives. The workshop will show how educational programs, cultivating STEM experiences and invigorating STEM activities are necessary for diverse, multicultural, socioeconomically and disadvantaged populations to foster and equip a growth mindset in STEM EDUCATION within the context of a global perspective. The STEAM Youth and Community Conference is run by a team of three University of San Diego faculty. 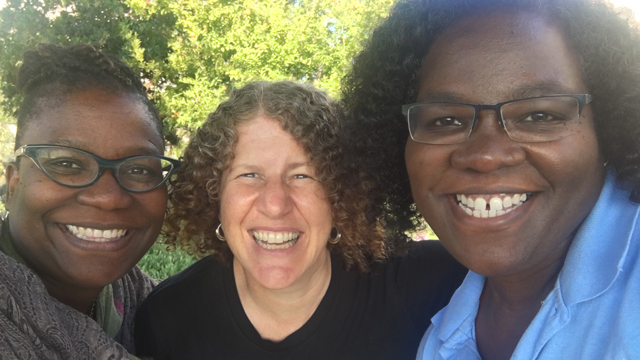 Dr. Odesma Dalrymple, Dr. Perla Myers and Dr. Joi Spencer are accomplished educators with expertise in STEAM instruction across the K-16 pipeline. In addition to providing the conceptual development of the STEAM Team Summer Academy, they also serve as lead instructors for the engineering and mathematics learning experiences for the STEAM Team Summer Academy. Dr. Dalrymple, Dr. Myers and Dr. Spencer coordinate all aspects of the Academy including the selection, hiring and supervision of instructors and student-assistants, and the coordination of the camp schedule and activities. Learn more about these women! Anywhere on campus is free parking on weekends. Park either in Mother Rosalie Hall parking garage or in the parking lot in front of Shiley Center for Science and Technology. Our conference is dedicated to providing a harassment-free experience for everyone, regardless of gender, gender identity and expression, age, sexual orientation, disability, physical appearance, body size, race, ethnicity, religion (or lack thereof). We do not tolerate harassment of conference participants in any form. Sexual language and imagery is not appropriate for any conference session. Conference participants violating these rules may be asked to leave the conference at the discretion of the conference organizers. Co-hosted by Shiley Marcos School of Engineering, College of Arts and Sciences and School of Leadership and Education Sciences. We are always looking for additional sponsors who want to help us facilitate this event. For inquires about becoming a sponsor, email us at steam@sandiego.edu.